It’s always a headache when it comes to structure removal, including obtaining permits, recycling materials, environmental clean-up, and proper site preparation. It is always a good idea to contact a demolition contractor who is trained to take care of such matters. Though at Demolition & Bobcat Service Los Angeles wrecking is our job, but we actually use a lot of subtle science and skill as we destroy. We have the proper equipment to remove steel, cut concrete, dig up underground tanks, strip interiors, or even implode entire buildings. We can break up parking lots, clear debris after natural disasters, and we can do it all while keeping everyone safe and healthy. We handle complete destruction project, also do it quietly, without disturbing other projects or current operations of a facility. Some bigger structures and buildings require official permission to be destroyed and need to pass state regulations, which means obtaining local approval and surveying permits while we handle a demolition project we take care of every legal perspective. Plus, we take care of other authorizations, such as notifying electric, gas, and water companies. The cost of the demolition is something that a client also needs to consider. 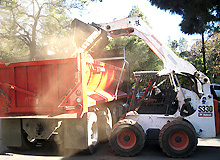 The Demolition & Bobcat Service Los Angeles provide with a detailed quote on the entire demolition project–from the initial planning stages, right through to the salvage and rubbish removal stage. We outline everything in the quote exactly how the demolition will be carried out, what equipment and labor will be required, the cost of rubbish removal, the cost of asbestos removal if it is required, and the cost of any additional services that we foresee as being necessary. The quote will also include a time frame in which the demolition will be carried out. Call us today for free estimate on 1-888-666-8808.